Now available in paperback, this New York Times bestseller features a new foreword by the author, fully updated images throughout the text, and the latest scientific data that supports the effectiveness of the program. 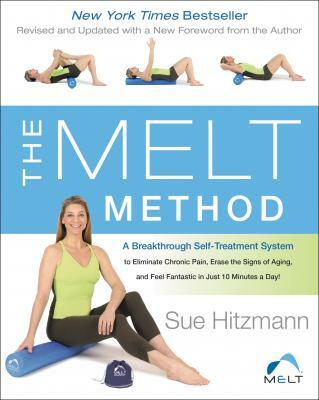 In The MELT Method, therapist Sue Hitzmann offers a breakthrough self-treatment system to combat chronic pain and erase the effects of aging and active living—in as little as ten minutes a day. With a focus on the body's connective tissues and the role they play in pain, stress, weight gain, and overall health, Hitzmann's life-changing program features techniques that can be done in your own home. A nationally known manual therapist and educator, Hitzmann helps her clients find relief from pain and suffering by taking advantage of the body's natural restorative properties. The MELT Method shows you how to eliminate pain, no matter what the cause, and embrace a happier, healthier lifestyle. Sue Hitzmann, MS, CST, NMT is the creator of the MELT Method®, a simple self-treatment technique that helps people get out and stay out of chronic pain. A nationally recognized educator, manual therapist, exercise physiologist, and founding member of the Fascia Research Society, Sue is the author of the New York Times bestselling book The MELT Method, which has been translated into eight languages and helped over 200,000 people lead a healthy, pain-free life.